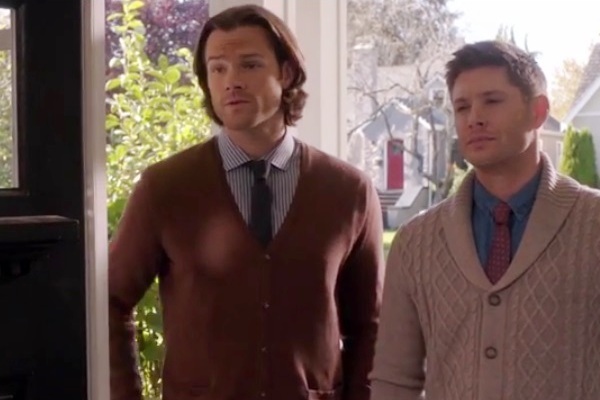 After the myth-arc heavy Our Little World (11.06), expertly reviewed by Stacey Gillard, next up were two MOTW episodes in a row, both great examples of how well Supernatural still does TV like this after so many seasons. Few other shows can mix horror, humor and pathos quite as well as Supernatural can. Plush (11.07), written by Eric Charmelo and Nicole Snyder and directed by Tim Andrew, is a stand alone story centered around costumes haunted by the vengeful spirit of their former owner, a children’s entertainer named Chester Johnson (Adrian Glynn McMorran). When innocent people suddenly turn murderous after donning the donated costumes, Sheriff Donna Hanscum (the ever charming and comedically brilliant Briana Buckmaster) suspects supernatural shenanigans and calls in the Winchester brothers to help investigate. It’s always great to see Sheriff Donna and she and her new partner Doug (a sweetly funny Brendan Taylor) made the very most of the material they were given. I was a little sad that so many of the jokes around Donna were still about dieting, but the wonderfully talented actress used her moments on screen with great depth and charm. 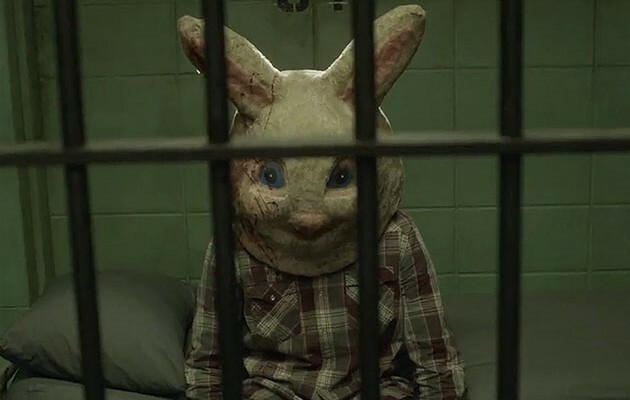 The masks and costumes were truly disturbing and the music, directing choices, VFX, make up and lighting all contributed to some good old-fashioned scares. 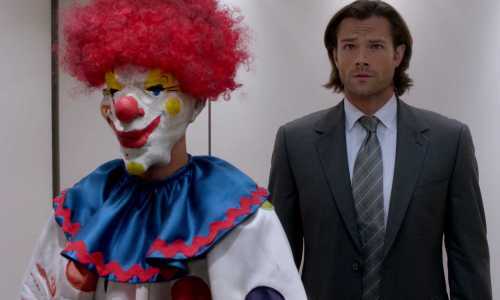 Of course, nothing beat the moment the super creepy, blood spattered, knife-wielding clown stepped into the elevator with Sam. Jared Padalecki conveyed the younger Winchester’s well known phobia with palpable panic and I cheered when Sam was able to overpower his biggest fear and save the innocent man inside the scary suit. It turns out that Chester was wrongly accused of being inappropriate with the children he loved to entertain, albeit with some super creepy outfits; and after being pretty much sold out by his sister, he was killed vigilante style by two local dads and bullies. His ghost attached itself to the masks in order to exact posthumous revenge and only after all of them were found and burned, was Chester properly ganked and sent on. The overall story did not have much of a connection to myth arc or the brothers, other than Chester’s sister realizing that she should have trusted her brother and should have communicated with him; a lesson that prompts Sam to open up to Dean about his visions about hell and the cage. He confesses that he feels god is sending him the message that the cage is where they will find answers about how to defeat Amara, a notion that rightfully does not sit well with Dean. 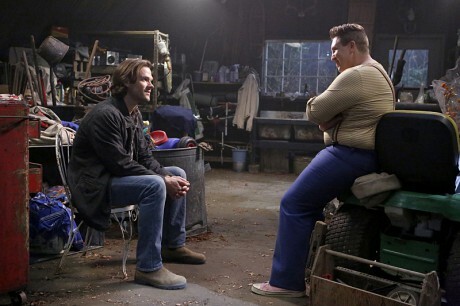 On the other hand, last week’s episode; Just My Imagination (11.08), written by Jenny Klein and directed by first time Supernatural director but long time show friend Richard Speight Jr. (Gabriel), was all about connecting to the story of the brotherhood of Sam and Dean. A story I feared a little going in, since it was to show us a glimpse into the beloved Weechesters, turned out to be not only sweet and poignant, but hilarious as well. We meet up with Sam as he wakes up early (6:30am, really?) and stumbles into the bunker’s kitchen only to find a table full of sweets and a strange little man with rainbow suspenders. Sully (Nate Torrence), Sam’s once imaginary childhood friend, has returned to ask for help. Knowing that Sam doesn’t only hunt things but also helps people, Sully reports that a fellow imaginary friend, or Zanna, has been killed. To Sam’s surprise and Dean’s hilarious dismay, they learn that Zanna are actual creatures born of a child’s imagination in a time of need, meant to guide and support until the child can stand on their own again. Dean’s reactive ninja moves and the grumpy dad/scolded child dynamic between him and Sam are not only incredibly funny but also revealing about the familial history between these two characters. Kudos to Richard Speight for managing to capture the subtleties of this relationship and to Jared Padalecki and Jensen Ackles for embodying their characters with such ease and authenticity. Right from the beginning Sully’s devotion to Sam is obvious. The only purpose of a Zanna is to be there in support of their child, and at every turn, Sully’s main concern is for Sam’s well being. It is interesting to see how the different imaginary friends we meet along the way actually help each child. Some help them keep their schedule and some bring fun and yet another helps with embarrassment and an absent parent. It seems like each friend created fits the child from whose imagination they spring, perfectly. Who else thought that air-guitar wiz Weems (Edward Witzke) perhaps would have been a good imaginary friend fit for Dean as a youngster? In a flashback, we see how Sully was there for Sam in a time of need. Now, I have to say that I found it a little unbelievable that John would have left Sam all alone for days on end at the age of nine, especially when we know how militant he was in insisting Dean watch over his brother but I understand how that was used to set up the story. Dylan Kingwell makes a sweet, perhaps too innocent, young Sam and it was a nice surprise to see Dylan Everett again as young Dean, as the actor has really managed to make that role his own. I found it endearing that Sam clearly had told Dean about his new imaginary friend and also that Dean tried to get John to bring Sam along on hunts. 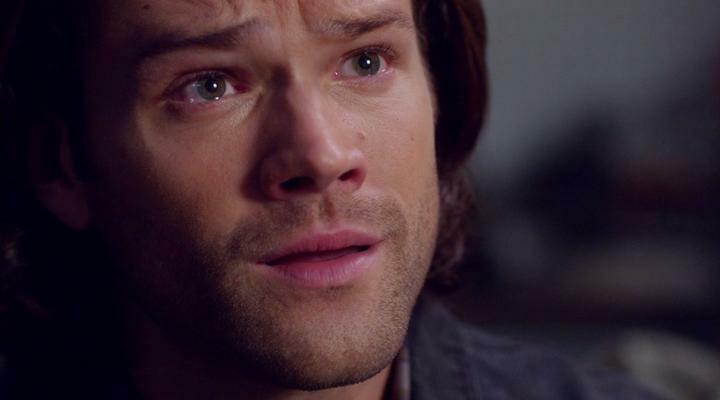 How heartbreaking to see Sam dreading to pick up that ringing phone, perhaps expecting bad news about his father or brother and to see Dean pulled away from talking to Sam by an impatient John. It made perfect sense to me that young Dean would have teased Sam about having an imaginary friend in the first place, but piling it on top of present Dean’s unsympathetic stance on the matter, it was a little harsh at times, even for typical grumpy and pragmatic Dean. When Sam proclaimed needing Sully to begin with because he was a pretty lonely kid, Dean’s emphatic; “You weren’t lonely, you had me!” certainly betrayed how matter-of-fact Dean’s love and caring for Sam is to him and how he couldn’t fathom Sam needing something more, which made it all the more satisfying to see Dean soften and gain insight throughout the episode. Jenny Klein and Richard Speight managed to build absurdity, humor and pathos into the story, but it was the actors who filled all the spaces in between with little treasures along the way. It rang so familiar to see Sam’s exasperation with Dean’s inappropriately timed jokes. The expressions on the faces of Sam, Dean and Sully were simply priceless as they watched oblivious mom Linda (Carrie Genzel) accidentally smear the brutally murdered Sparkle’s glittery blood all over her face as she walked through the, to her invisible, bloodbath. 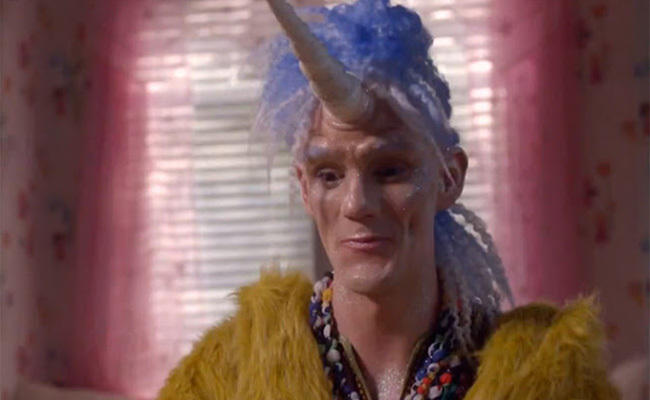 Sully’s horrified: “She’s got Sparkle on her face” still makes me laugh. Jensen Ackles’ comedic timing was spot on as always, but it was a treat watching him portray Dean slowly realizing what Sully’s friendship really meant for Sam. 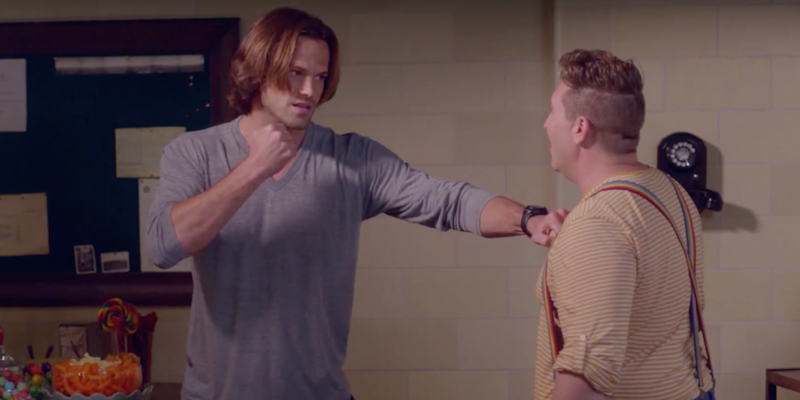 And then there is Jared Padalecki, who throughout the episode was able to connect the dots between flashback and present day by injecting an incredible childlike quality into Sam in his interactions with Sully. This was especially evident when Sam confesses his true fears about his visions of the cage, adding an emotional depth to the scene. Of course none of it would have worked without the considerable talent Nate Torrence brought to the character of Sully. A guest actor can make or break an episode such as this and Mr. Torrence seems to have elevated everyone’s game. In the end it is a girl grieving the loss of her twin sister to a childhood accident, who has been hunting the Zanna. When Sam finally catches up with Reese (Anja Savcic), she has Dean at knife point and she is out for revenge. She blames Sully, not only for her sister’s death but also for abandoning her to grieve alone. It seems to me clear why Sam conjured up Sully to be his imaginary friend. So many of his qualities, fears and doubts match Sam’s. Loyal, willing to sacrifice himself for another’s well being, always thinking of his loved one first, but also prone to self blame and guilt; sound familiar yet? I have to admit that I teared up during the scene where Sully offers only love and acceptance in the face of Reese’s anger and pain. Dean, who knows a thing or two about the cost of anger and revenge, is able to help convince Reese that Sully is one of the good guys, proven by how he was there for his little brother when Dean wasn’t. Dean and Sully finally acknowledging and thanking each other for their love and care for Sam was the perfect culmination of all the tension between them throughout the episode and again showed how well built this story was. It seems as if it was not for nothing that Sully appeared in Sam’s life again when he did; as much as Sully needed Sam’s help, Sam also needed Sully. Since Sully sprang from Sam’s imagination, the lessons are pretty clear; heroes aren’t perfect and they do the hard important thing even if they are afraid. I’m not sure that trusting that it is god sending Sam these visions and that going to the cage to talk to Lucifer is the best plan, but then neither was running away at the age of nine. Sam chose to stick with Dean back then and he is firmly committed to fight at his brother’s side now. Here’s hoping that they will keep facing these threats together, since that is the way the Winchester win. I simply loved this episode and am excited as the season unfolds. This week’s upcoming mid season finale promises to be a doozy and although I am a little leery of the treatment this particular writing pair will give such an important part of the Winchester mythology as the cage, considering what they did with hell in season 8’s Taxi Driver, I am looking forward to seeing more of adult Amara and the return of another major character from the show’s past. What are your thoughts about the season so far and what is coming up next? Tell us in a comment below.